South Korea's National Intelligence Service said 06 March 2019 supply vehicles had been observed at the Saneum-dong missile research center on the outskirts of Pyeongyang. The Saneum-dong site is believed to be used for developing ballistic missile technology, testing rocket engines and producing ICBMs. Seoul's Ministry of National Defense said it's closely monitoring the situation during a regular press briefing. "We are keeping a close eye on North Korea's nuclear and missile facilities including the Dongchang-ri and Saneum-dong sites. Also, defense intelligence officials from South Korea and the United States are maintaining close coordination." The defense ministry added it has strong speculation on the purpose of North Korean activity at these missile-launch sites, but refrained from saying what it is. Although commonly identified by US government sources as the Sanum-dong Research and Development Facility, this entity is actually located about 14 km north of the center of P'yongyang at Namgungni-Sanum-dong. 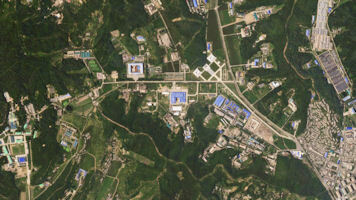 The facility is reportedly involved in the assembly of ballistic missiles and components. In late 1999 it was reported that North Korea was continuing preparations for the first test of the long-range Taepo Dong 2. A classified 19 November 1999 intelligence report by the National Imagery and Mapping Agency indicated that activities photographed at a facility at Namgungni, northeast of central Pyong-yang, were consistent with test preparations. The James Martin Center for Nonproliferation Studies based in California disclosed satellite imagery that captured a new building around Sanum-dong in Pyongyang in 2016. 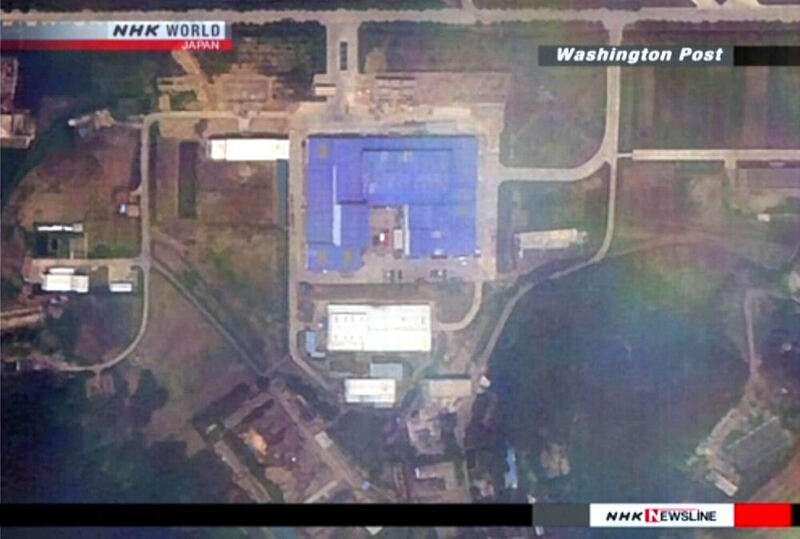 Recent satellite imagery unveiled a new facility in North Korea, suspected to be aimed at advancing the country's intercontinental ballistic missile program. This place is situated in Pyongyang, North Korea, its geographical coordinates are 39°08'58" North, 125°46'30" East [Latitude : 39.149 Longitude : 125.775] and its original name (with diacritics) is Sanum-dong. New satellite images analysed by the US-Korea Institute at Johns Hopkins University, released on the 38 North web site in January 2014, indicate that work is under way to modify the gantry tower at the Sohae Satellite Launching Station. "Recent satellite imagery indicates definitively that the work is intended to allow future launches of larger rockets by adding an upper platform to the tower as well as making changes to the mobile launch stand," the report said. "One possibility is that the gantry and pad are being modified to handle a large 40-meter [131 feet] long rocket based on the mockup reportedly spotted at the Sanum-dong missile facility outside Pyongyang in April 2012." The nongovernmental Center for Nonproliferation Studies, which unveiled new images 09 February 2017, assessed that the North was rapidly moving along to improve its missile capabilities. The center compared the recent images with those taken back in 2009 and confirmed that a new facility was erected on what was once a wasteland. The nonproliferation center believed the new facility is likely a center for intercontinental ballistic missile(ICBM) research or a storage house. The center cited that the facility is big enough to store a 30-meter Kwangmyongsong rocket as it measures 66 meters wide and 30 meters long. It assessed that the facility expansion demonstrates that Pyongyang "continues to rapidly build out its missile program" despite international warnings. On the center’s assessment, the U.S.-based news outlet CNBC projected that the North could test-fire an ICBM in the next few months given that the Donald Trump administration has just launched and as the incumbent and former North Korean leaders’ birthdays are in February and in April. The latest assessment came after the head of the U.S. House of Representatives Armed Services Committee stressed the need for the U.S. to expand its missile defense systems amid threats from North Korea and Iran. With fears rising that the North’s military provocations could also threaten the U.S. mainland, Washington is expected to take stronger responses. The Washington Post reported 30 July 2018 that US spy agencies were detecting signs that North Korea was producing new intercontinental ballistic missiles at a plant on the outskirts of Pyongyang. The leading US daily published the report in its online edition, citing officials familiar with intelligence information. It said satellite imagery acquired in recent weeks, and other evidence, suggested ongoing work on "at least one and possibly two" liquid-fueled ICBMs at the plant in Sanumdong. It said North Korea used the same factory in the past to produce the Hwasong-15, an ICBM that is said to be capable of reaching as far as the US East Coast. The report said the findings are the latest to show that activity continues inside the North's nuclear and missile facilities, even after the June 2018 summit between the United States and North Korea. Donald Trump maintained that talks with North Korea are progressing smoothly, following his meeting with the North's leader Kim Jong Un. But US media raised doubts over Pyongyang's commitment to denuclearization. 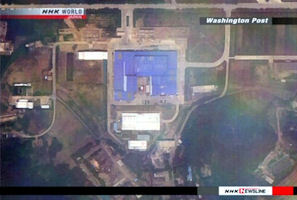 Recent reports said the North runs a covert site in the suburbs of Pyongyang to produce weapons-grade enriched uranium. The Post said new evidence, including satellite photographs, indicate the missiles are liquid-fueled intercontinental ballistic missiles and are being constructed at a factory that produced North Korea's first such missile capable of reaching the United States. The paper says the new intelligence does not indicate that North Korea has expanded it capabilities, but rather that it is continuing to work on advanced weapons in the weeks following the Singapore summit between Donald Trump and North Korean leader Kim Jong Un. Vehicles were photographed moving in and out of the North's research facility at Sanumdong, a senior official told Reuters. A covered trailer photographed entering the site appears to be identical to vehicles previously used by the North to transport ICBMs. The pictures do not show how advanced the reported missile construction might be. The White House did not respond to the reports, saying it did not comment on intelligence. A senior official from South Korea's presidential office also declined to comment, but told Reuters that US and South Korean intelligence agencies were closely monitoring the North's movements. Joel Wit, a former State Department negotiator and founder of 38 North, a North Korea monitoring project, said on Twitter that it was "unrealistic" to expect Pyongyang to stop its programs "until the ink is dry on an agreement." Independent missile experts reported observing activity consistent with missile construction at the Sanumdong plant as well. “It’s active. We see shipping containers and vehicles coming and going. This is a facility where they build ICBMs and space-launch vehicles,” Jeffrey Lewis, director of the East Asia Nonproliferation Program at the James Martin Center for Nonproliferation Studies, said. The satellite imagery was not the first sign that North Korea may be continuing development at its nuclear and missile facilities. In June, senior officials cited by US media said intelligence agencies believed North Korea had no intention of giving up its nuclear arsenal, and that the state had increased production of fuel for nuclear weapons. US Secretary of State Mike Pompeo also reported last week that the North was continuing to make fuel for nuclear bombs despite its pledge to denuclearize.